We are proud to announce 129 (and counting) people have registered for AAPT eAlliances! Have you ever felt isolated at a department meeting and thought "Maybe it's just me, but..."? Perhaps you are the only woman faculty member in your physics department, or the only faculty woman of color at your institution or maybe the only astronomer within a neutron star radius (10 km). Perhaps you have heard that networking and mentoring can help combat the isolation you feel, but how can you grow your own mentoring network? A new NSF ADVANCE grant entitled "Mutual Mentoring to Combat Isolation in Physics" might help you do just that. What are Mutual Mentoring eAlliances? If you are a woman faculty member in astronomy or physics, you are invited to become a participant in a mutual mentoring eAlliance sponsored by sponsored by the American Association of Physics Teachers (AAPT) with support from the National Science Foundation ADVANCE-PLAN D program. This project seeks to address the underrepresentation of women and minorities by creating ten eAlliances to provide mutual support and professional development. Project leaders are PI, Dr. Beth Cunningham, Executive Officer ofAAPT with co-PIs Drs. 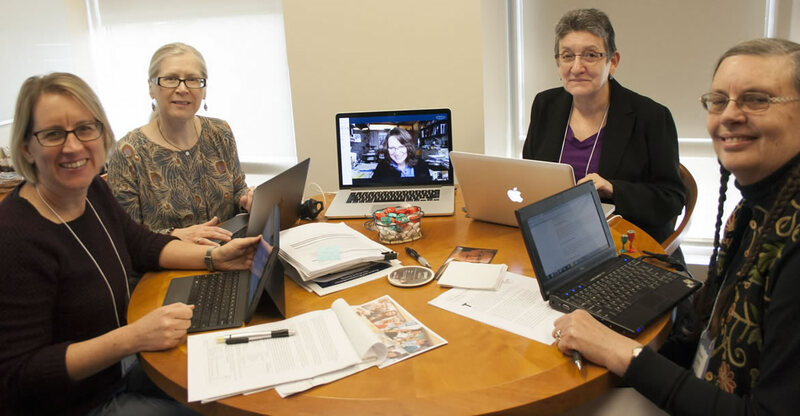 Cindy Blaha (Carleton College), Anne J. Cox (Eckerd College), Idalia Ramos (University of Puerto Rico at Humacao), and Barbara Whitten (Colorado College), all Professors of Physics who have been engaged in previous NSF-ADVANCE projects. They will provide support to the eAlliances, each of which will form with a cohort of five participants and begin with an initial in-person meeting. The eAlliances will hold regular electronic meetings and shape the focus of their discussions based on member interests. In addition, sponsored eAlliances will receive travel support to meet together annually at a national professional meeting and funding to participate in project Summit Meetings. Anyone who is interested in a mutual mentoring network. However, because of the constraints of our NSF-ADVANCE funding, only women faculty in physics and astronomy can receive travel support. What do you need to do as an eAlliance member? but detailed enough to allow individuals to describe their experiences, views, attitudes and benefits of participation. These activities will identify the benefits of mutual mentoring networks and their impact on career development. So you can benefit from the support and encouragement of your eAlliance colleagues while contributing to the research that will help the next generation of women faculty in STEM fields. While the project is sponsored by AAPT, you do not need to be a member to participate. All women faculty in astronomy and physics are welcome! Does mutual mentoring really work? There's a body of literature that shows mentoring networks to be very beneficial to the career development and professional satisfaction of women faculty (link to our site resource room. Three of the project leaders have been members of a mutual mentoring cohort of five women physics professors at liberal arts colleges that initially received NSF-ADVANCE support from 2007-2010. Details of our mentoring cohort have been described in a Scientific American blog. (and an April Physics Today link perhaps?) We have experienced such great personal and professional benefits from our mutual mentoring discussions that we continue to meet regularly long after NSF funding ran out and we are eager to extend the opportunity to other groups of women faculty through this project. There was only one astronomer in our cohort of physicists, but we found our cross-disciplinary discussions to be enormously beneficial. As discoveries in physics or astronomy made the news, we could freely ask each other questions about topics we hadn't thought about since our undergraduate days. We came to more fully appreciate the complementarity of our sub-disciplines. And though we were all senior women in our cohort, the eAlliance project seeks to engage women faculty at all stages of their careers and from all of our fields' disciplines. What can mutual mentoring do for me? Why me? How could this help me navigate my professional life? The opportunity to discuss issues with other women who have had similar experiences can be a resonant phenomenon. How can I become part of an eAlliance? To join an eAlliance the first step will be to complete an online questionnaire with information that will be used to match you with other participants with common interests (type of institution, faculty rank, ethnicity, family situation, and others). All the information will be confidential and your name or other data will not be revealed unless you decide to share it. And although only women faculty can become part of the sponsored eAlliances, we hope that all isolated physicists and astronomers will use the on-line mentor matching algorithm more broadly to form their own mentoring networks. Who will see the information I share with the eAlliance project? You will need to provide your name and professional email address to the site, so we can verify your identity. However, others on the site (other than the management personnel) will not obtain this information without your permission. Individual responses will be held in a database that can only be accessed by the grant management team, but will be used to calculate a match score between you and others in the database. You will not be able to see their individual responses nor they yours, only how well your individual responses correlate. When will eAlliances start forming? The eAlliance project will go live in July 2016 at the Summer AAPT meeting. Beth Cunningham and Cindy Blaha will be presenting on this mutual mentoring project at the meeting. For more information on the meeting click here. Can I be notified when the eAlliance registration goes live? We hope you will consider joining this project as a participant. If you are interested, please go to eAlliances.aapt.org to find out more information and to register. If you have further questions, please contact us at eAlliances@aapt.org. Support from NSF ADVANCE-PLAN D (HRD-1500529).